More than 150 CO4Kids campaign partners, those working to insure that Colorado is for kids, met Tuesday, April 2, at the Capitol in Denver to help launch Child Abuse Prevention Month. During a press conference, Governor Jared Polis addressed the crowd of several hundred, highlighting the recent lengthening of the statute of limitations in child sexual abuse cases in Colorado and honoring child advocates. "In Colorado," said Polis, "we value children and are duty-bound to protect our youngest and most vulnerable citizens from abuse and neglect," said Governor Polis. "I am inspired today by the tireless work of our community members and child advocates, and by the dedication of these Unsung Heroes who have taken it upon themselves to support families in their communities and to help us build a Colorado for kids." 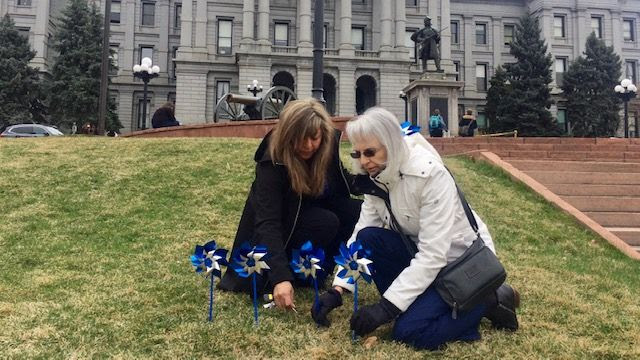 Representing the Rocky Mountain Conference, Noemi Borjon, HR Assistant, and Jackie Dunkin, HR Clerk, carried blue and silver Pinwheels for Prevention and planted them on the Capitol lawn after the press conference. 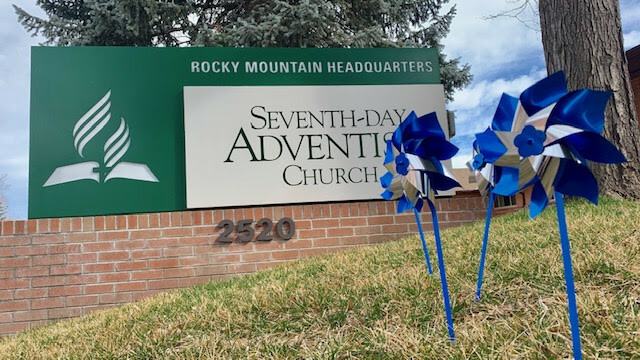 The following day in front of the Conference office, Borjon and Dunkin led other RMC employees in creating a garden of Pinwheels for Prevention on the front lawn of the RMC Office. Many voices are speaking out against abuse toward children and women within the Seventh-day Adventist Church. Last September, the North American Division held an enditnow summit on abuse. Their aim was to keep “people in your church, school, and camp safe”. A global initiative, the enditnow group seeks to raise awareness and to advocate for the end of violence around the world by mobilizing Seventh-day Adventists and inviting other community groups to join them. Similarly, a number of social groups have recently sprung up throughout the North American Division. Samantha Nelson is the CEO of Survivors A top-rated non-profit, The Hope of Survivors is a group based in the Rocky Mountain Conference that offers support, hope and healing for victims of pastoral sexual abuse. Their caring has expanded to Romania, Australia, and Canada. A young millennial and member of Newday Church and student at Colorado Christian University, Katie McTavish desires to be “a voice for the voiceless in the fight to abolish modern-day slavery." Her passion for this cause led her to volunteer last summer in Central America.